Following requests from some of you on the previous article on Firebase Analytics, today we're going to cover Firebase Cloud Messaging integration in your application developed with Eclipse. It is not much different from the Firebase Analytics integration, so here we go. dandar3/android-google-firebase-README gives you an overview of the Firebase libraries available to use with your Eclipse project. Have a look at the two YouTube videos at the end covering the installation of the Subversive plugin and the steps to easily import entire project sets like dandar3/android-google-firebase-messaging in your workspace. If you're having trouble with getting this right you could use Android Studio to import firebase/quickstart-android GitHub project, deploy your google-services.json into it and then copy the generated values.xml out. 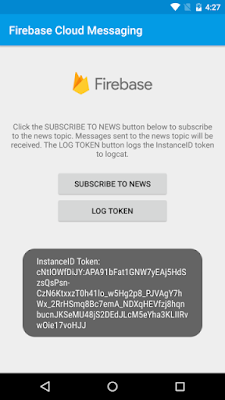 On top of that you will have to add your own FirebaseMessagingService and FirebaseInstanceIdService implementations to handle messages and registration tokens as detailed in Firebase documentation > Set Up a Firebase Cloud Messaging App on Android. 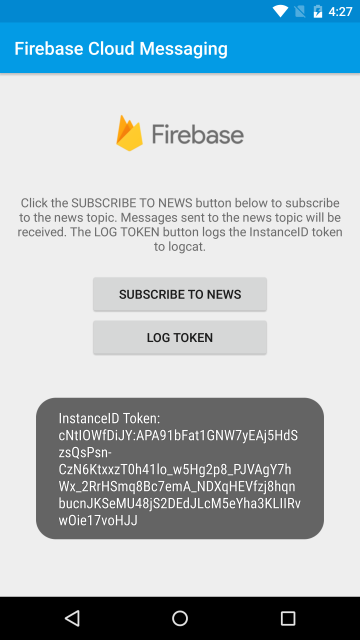 If everything was set up correctly and you have implemented a similar logic to the classes mentioned in the above documentation and working sample, you can subscribe through the app to a topic and have messages sent to those subscribed that way (see Send Tipic Messages with Firebase Console) or you can obtain the registration token and send messages to that one device (see Send a Notification to an Android Device). 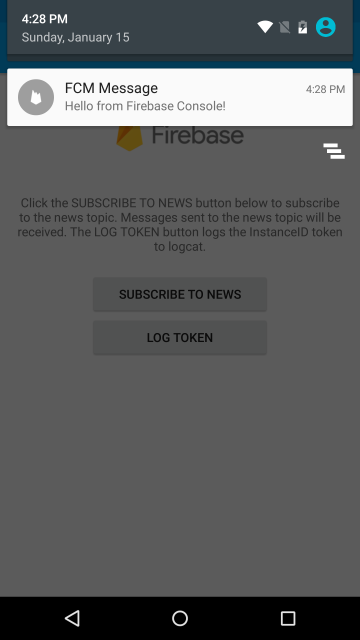 D/MyFirebaseMsgService( 1983): Message Notification Body: Hello from Firebase Console! 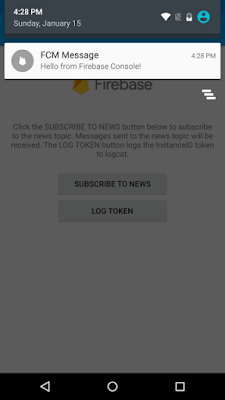 See sendNotification() and the note at the end of MyFirebaseMessagingService.java if you want to transform the message into a system notification. It probably means you haven't imported the respective libraries from GitHub into your workspace (I see messaging, iid, support-v4 classes) or you haven't attach firebase-messaging to your Android app project in project Properties > Android > Library section (down). Thanks! the MyFirebaseMessagingService.java is working now. However after making changes to Mainactivity.java. - failed to resolve REGISTER intent, falling back. I would make sure to use the latest Google Play Services and Firebase packages (10.0.0 as of now, 10.0.1 should be just a minor fix, soon to be available) and test it on a device that does have Google Play Services installed. "FCM clients require devices running Android 2.3 or higher that also have the Google Play Store app installed, or an emulator running Android 2.3 with Google APIs. Note that you are not limited to deploying your Android apps through Google Play Store." You need to start practicing your google.com and stackoverflow.com search skills :-) As it says in the earlier message "or an emulator running Android 2.3 (or higher) with Google APIs". This is an article from Intel going through creating an AVD with Google APIs(as they've helped providing images optimized for working on Windows and Intel CPUs), the screenshots are from a Mac, but the programs are the same really (run "ANDROID_SDK\SDK Manager.exe" and "ANDROID_SDK\AVD Manager.exe"). You will need to install Intel HAXM either from SDK Manager (download from "Extras\Intel X86 Emulator Accelerator" then go and install ANDROID_SDK\extras\intel") or from Intel's website, it's linked in the article. Why is my adblogcat not showing anything? Hi! thanks for the information. However when i run the app and click on the log token, the token is generated. I copied the token and pasted into the firebase console registration token. However, after sending the message my android emulator is not receiving any notifications. How should i fix it? You may be right to ask "why didn't you fully implement it here so we can see?" Because it was meant to tackle just the missing part for Eclipse, libraries and generated parts of the manifest, the rest of it should be just as documented and provided by Google. PS: Sorry, your comment went into Spam for some reason and could not see it until now. By the look of it tries to delete a shared preferences backup file that doesn't exist. You didnd't provide a stacktrace so I can't decompile a class to look at it and see what it does, but I would assume maybe you're running this on an emulator without external storage, or missing permission to write on external storage, not sure what's going on. I would suggest opening a new thread on StackOverflow with more details about it. I don't think this is a problem related to the libraries themselves or the directions suggested in this post. Hey, thanks for this tutorial. I tried it with IntelliJ, not using gradle. If you go to dandar3/android-google-firebase-README project on GitHub (linked in article above) you can see all the libraries you need grouped by Firebase library. I would suggest using Eclise to download an entire set easily (see the video explaining how to download an entire project set), then import in IntelliJ all projects from the Eclipse workspace. Dear Dan, Please can you helpthis, i m getting error in AndroidManifest.xml:86: error: Error: No resource found that matches the given name (at 'value' with value '@integer/google_play_services_version'). But still getting error R.java file also deleted and getting reference i m getting error in AndroidManifest.xml:86: error: Error: No resource found that matches the given name (at 'value' with value '@integer/google_play_services_version'). if you don't mine can you share any sample integration source ? I'll see if I can make a short video or a post with screenshots to show you how to add the libraries as dependencies to your app for Eclipse, they seem to be harder to find nowadays with Google removing those older references from their documentation. i add them (your app project > Properties > Android page > Libraries section). Hi Dan, I am using onesignal notification sdk and also used https://github.com/dandar3/android-google-play-services-ads lib Android app was missing the Google Play Services library. Can you give me more of the stack-trace to indicate which class is causing this? What version of Google Play Services / Firebase are you using? I would suggest removing all Google Play Services and Google Firebase libraries from your workspace and import using Project Sets, see more information in the videos down at the bottom of this page. I'm thinking there is a version incompatibility between two libraries in your workspace, it's easier to remove and add back in, Project Sets should do all the work for you, bringing all required libraries from the same version. Also you get the added bonus that showing the tag / version you can spot them very easily from Project Explorer. 1. Is the Support-v4.jar required? 2. The guide of firebase stated the prerequisite is Android 4.0. Will it got crash if running on Android 3.x ? 1. Yes, google-firebase-messaging depends on google-play-services-basement and that depends on android-support-v4. You can see that in the link below and at the bottom there are a couple of videos showing you how to download them all down easily using Team Project Sets. 2. It probably will crash on older APIs, newer versions use minSdkVersion="14", see their AndroidManifest.xml. Google Play services 10.0.x is the final release that includes full support for Android version 2.3.x (Gingerbread). Apps developed using future SDK releases after 10.0.x will not be able to connect to Google Play services on Android Gingerbread devices. To learn more about your options, including building multiple APKs to extend your app's support for Android Gingerbread, see the Android Developers Blog." Ant build can not be finished with: Please correct the above warnings first. Hi Dan, thank you for your amazing work, I just want to know that are you going to port firebase-database to eclipse soon? Thank you, Linh, you're quite welcome. I certainly can look into it, keep an eye on android-google-firebase-README next few days. I included all needed projects and added them as library to my project. I am I missing maybe something? Those classes look like they're part of Google's firebase/firebase-jobdispatcher-android project on GitHub. How did you get to reference those? You should be able to download the project (Git or ZIP), import "jobdispatcher" folder and add "java" as a source folder. They were inside the example files. I ended up removing the dependencies. They are only needed if you decide to use the firebase job dispatcher. I guess what you are proposing is gonna work for the people that want to use them. ;) Cheers! I am not actually starting my project. But I finally see the token pop-out in logcat screen. Thanks for 10000000000000000... time. You save everything. Unable to get provider com.google.firebase.provider.FirebaseInitProvider: java.lang.ClassNotFoundException: Didn't find class "com.google.firebase.provider.FirebaseInitProvider"
com.google.firebase.provider.FirebaseInitProvider is part of google-firebase-common project, check if you have that imported in your workspace. Have you analyzed the APK with dex2jar (https://sourceforge.net/p/dex2jar/wiki/UserGuide/) or apktool (https://ibotpeaches.github.io/Apktool/install/) to see if the class was packaged correctly? Do you use Android Support Multidex library (https://github.com/dandar3/android-support-multidex)? well, i am an idiot. I have mixed up the package names. thats why it cannot find the class name. Now it's working fine. Thanks alot. Apologies for late reply, I'm glad you sorted it out!